The web has become more of an all-access gateway for cyber criminals rather than a benign convenience for users. Hackers are targeting end users through social engineering attacks, legitimate websites, and mobile apps as well. Recently, an Android keyboard app has leaked data of 31 million users online. Cyber criminals now have more ways to bypass user security with schemes such as man-in-the-mobile attack, man-in-the-browser, man-in-the-middle, malware, phishing, and financial fraud. Hence, wise investments are needed to be made in cyber-security to protect the end-users. Cyber criminals are coming up with better techniques to extract data and money from users. 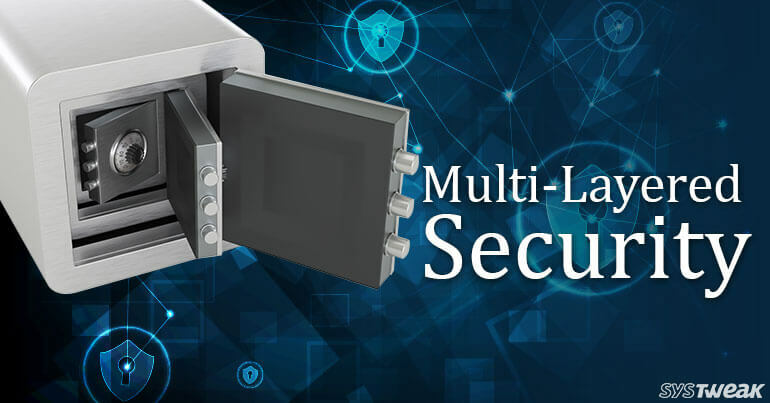 To stop them, a multi-layered security approach is the best option available. You don’t have to protect every asset with this approach. Only the most critical assets like confidential and personal information require to be protected by multi-layered security approach. Therefore, even if one security system fails, the other systems will take care of the assets. Physical Security: It is about how physically secure your machine or your data is in your premises. May be it your home or office, your physical devices should be secured at any cost. Let’s not deduce its importance. For organizations, make sure that adequate amenities like key cards, port block-outs, locks, gates and guards are present to protect data. However, the lines between information access and physical access are blurring as they can be now bound to each other. Network Security: Network security should be always enabled with routers and switches with security features, IPS (Intrusion Prevention System) or IDS (Intrusion Detection System), and firewalls. Domains of trust and LANs should be established for security and to manage traffic. Updates and security patches for the system. Application Security: Application security consists of techniques like protecting applications with usernames, PINs, passwords, and different codes. You can also improve application security through multi-layer authentication methods like combining biometrics and OTPs with regular passwords. In organization, you can manage critical data with Role-based access control system. Additionally, security practices related to how to use an app should be followed both at home and workplace. Cyber threats are evolving continually. Therefore, pretending that they don’t exist or staying relaxed without implementing security measures is foolishness. We require a prolonged vision for cyber-security measures. Including multi-layered approach in security, the risk factor will decrease eventually. Such an environment will improve productivity of systems. And we can reach our goal of staying technologically ahead of cyber criminals that frighten us today.